Later today, there could be fireworks on Capital Hill when Democratic members of the Senate Foreign Relations Committee finally grill Rex Tillerson on his potential nomination as Secretary of State. Tillerson may also face hostile questioning from Republican Senator Marco Rubio, who if he votes with the Democrats could block Tillerson’s nomination. The Committee currently stands at 10-9 between Republicans and Democrats. Exxon’s Climate denial. Much has been written recently about Exxon’s decades long denial of climate change. For decades Exxon poured tens of millions into the climate denial movement. The company is under a criminal investigation now for lying to the public and share-holders. It is the scandal which is known as #Exxonknew. It is hard for Tillerson to extract himself from his old employer’s deceit and denial. Later this month, he is also due to testify in a lawsuit brought by 21 young people alleging that Exxon and other companies has tried to prevent U.S. government from taking action on climate change. Exxon’s Ecological Record. Exxon is currently being sued for breaking clean air laws at the company’s huge sprawling Baytown oil refinery and chemical plant in Texas, more than 4,000 times between 2005 and 2010. Exxon has fought the case for 15 years. A Patriotic American or Putin’s Puppet? Again much has been written about Tillerson’s links to Putin. 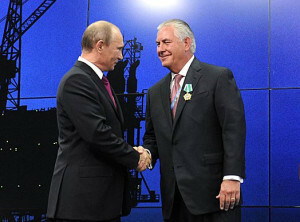 All the indications are that Tillerson will be Putin’s puppet in the US; pushing for sanctions to be lifted which will benefit Putin and his old company Exxon. Exxon is desperate to get into Russia’s Arctic. As the Financial Times reported in 2014, “Russia was going to be Exxon’s next mega-area. And the list of mega-areas in the world is very short.” Then came sanctions which Russia tried to flout. Despite sanctions, Tillerson sent an Exxon executive to a Russian business forum last year. Other Sanctions Busting: Exxon did business with Iran, Syria and Sudan through a European subsidiary at the same time as these countries were under US sanctions as state sponsors of terrorism. Tillerson says he will divest from 156 different entities within 90 days too. Some conflicts will be avoided, but many will not. No Experience as a Diplomat: Tillerson is the first Secretary of State to have no experience in the public sector which is seen as a first in modern US history. Numerous politicians and commentators have raised concerns: He may be great at doing oil deals, but “has no proven knowledge or regard for the norms and necessities that so much of our modern diplomatic and security efforts depend upon,” says Democratic Sen. Bob Menendez of New Jersey. “Mr. Tillerson has demonstrated he knows the corporate world and can put his shareholders’ interests first, but can he be a respected Secretary of State that puts the national security interests of the American people first? It remains to be seen,” US Senator for Maryland, and ranking Democratic committee member Ben Cardin, also said last month. Oilman or Statesman? Its time for the Senate to find out..